With personalized questions and a story script inspired by Martina Bex’ Spanish story “Una comida especial“, I invented a fun story about a boy who wants to impress a girl by cooking her favorite meal. Unfortunately, things go wrong because the boy wasn’t looking when he was preparing the meal and put weird stuff into the food! You can view and download the story script with a drawing exercise, alongside with guidelines on how to teach the story here. Learners can then read and mime each verse. They get tons of repetitions of “il a mis” and other high frequency verbs in the passé composé such as “il a bu” or “il est parti”. It is also an opportunity to discuss the typical French breakfast (which is not much!) and habits like smoking. I do believe it is important to include cultural activities into language acquisition because a language is more than just words and sentences, it is also another way of thinking, another culture. That is why I am always looking for ways to incorporate literature, films or special cultural events in my lessons. What about you? Do you also include culture in your teaching? How? 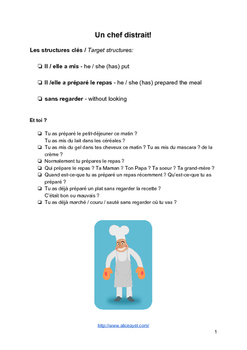 If you want to have access to the story, reading activities, a listening and comprehension activity on the poem, a reading with comprehension questions about the life of Jacques Prévert (the author of the poem) along with detailed guidelines and ideas on to plan your lessons, you can purchase the full package on my Teachers Pay Teachers store.